One tow hook and 14 cable ties later was back out using only asphalt. I did rebreak my front spoiler but other than that just a little dirt and grass. Last edited by Temekun; 07-06-2010 at 02:54 PM. just like riding a hoarse....get right back on. Just remember to wear your safety equipment. Everything else is replacable. Glad to see it was a minor incedent. Remember: there is a nice "embed picture" function on this forum - please be kind to those of us living in stone age and not having a facebook account and use that function. Just be glad you were on a track with runoff, if that was a tire wall the outcome would have been much worse. Nice that it ended relatively good! Could've been way way worse. The funny, scary part is that the corner workers missed me. I had my cell phone in the door, called my brother in the paddock and had him go tell the track officials I was out in the weeds. I had a great view of my session and the session after mine. It's an iPhone so I took some video of friends from the weeds. 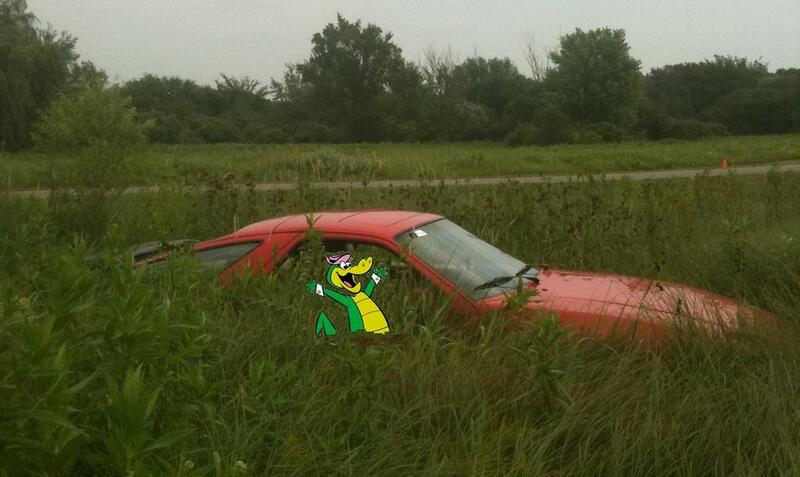 For some reason they are now caling me Gator. It took me almost 3 hours to work up the courage to look at this thread! If you haven't had an "agricultural excursion" at a track, you haven't been driving anywhere near your capabilities (or the cars capability, which I'll never reach!). Glad it was only a grass/weeds incident. I've had two of those with no consequences. Now - the concrete Jersey barrier I became intimate with at Mt. Tremblant - THAT's a different story altogether (a 928 organ donor resulted from that). Keep up the fun, and the shiny side up. Looks like you have an S4 spoiler on an '86. There's yer problem, messin wit the Porsche design. Glad no real damage to you or car. I trail braked myself into my first spin and off..only hit a low tire barrier and didn't even break the spoiler.